« SCORE!!!!! 1987 Gibson ES-335! 50’s-style pickup wiring (either volume knob acts as a master, but the tone controls have a different cap value that doesn’t throw a blanket over your tone when you turn it down – this is crucial for playing in the bridge pickup). Tone Bone Score: 5.0 ~ This guitar sounds and plays like a dream! While the action is a just a tad higher than I like it, the guitar still plays ultra-smooth. I already talked about how I happened to get this guitar, so I won’t bother rehashing the details. Suffice it to say that I got this guitar for an absolute steal. In a way, this guitar is sort of redemption for me having sold my original ES-335 a couple of years ago when times were tough. So getting this guitar is a real milestone for me. 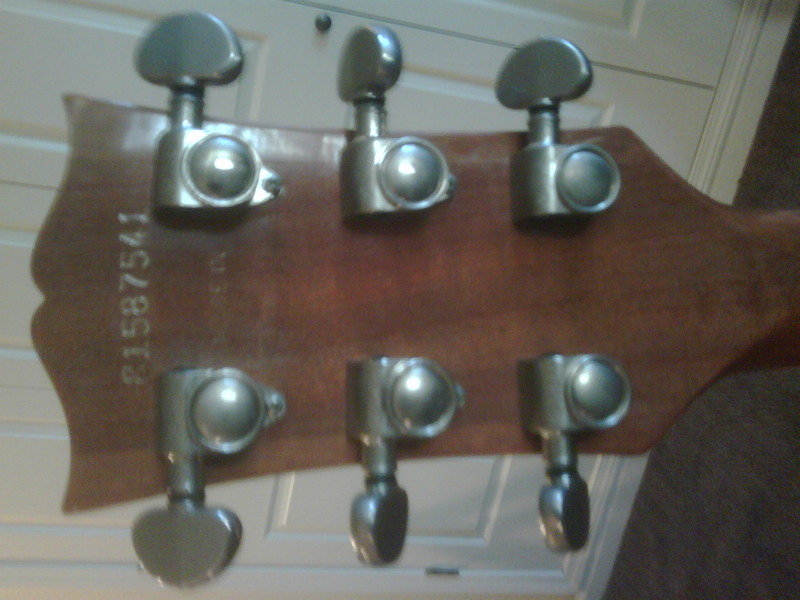 For a 23 year old guitar, it is in absolutely amazing shape. 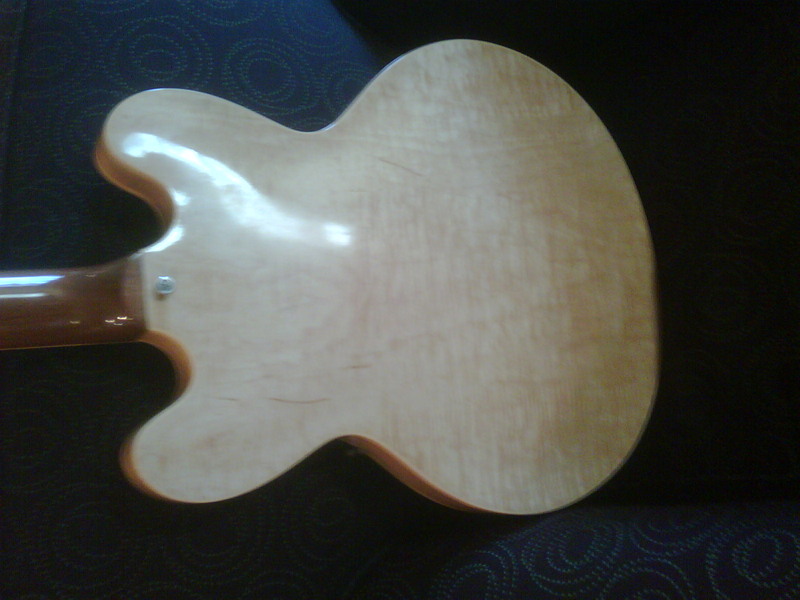 The body has some very minuscule dings in it that fortunately don’t penetrate the finish. I didn’t notice any checking in the gloss either, though that may occur after a few more years if the finish Gibson used was a nitro lacquer. The hardware is aged as to be expected, though there’s a little oxidation in the brass stop tailpiece that can easily be removed. 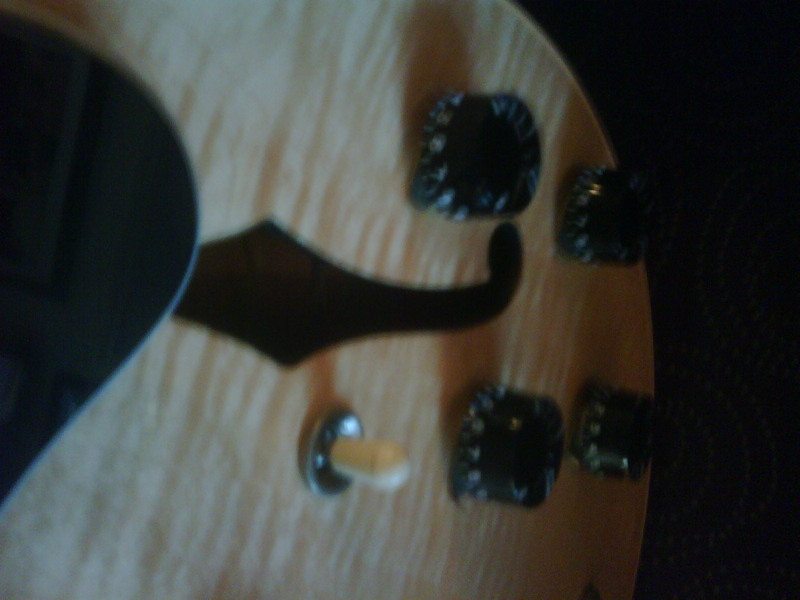 The pick guard has pick marks on it, but no scratches and all the joints are perfect. 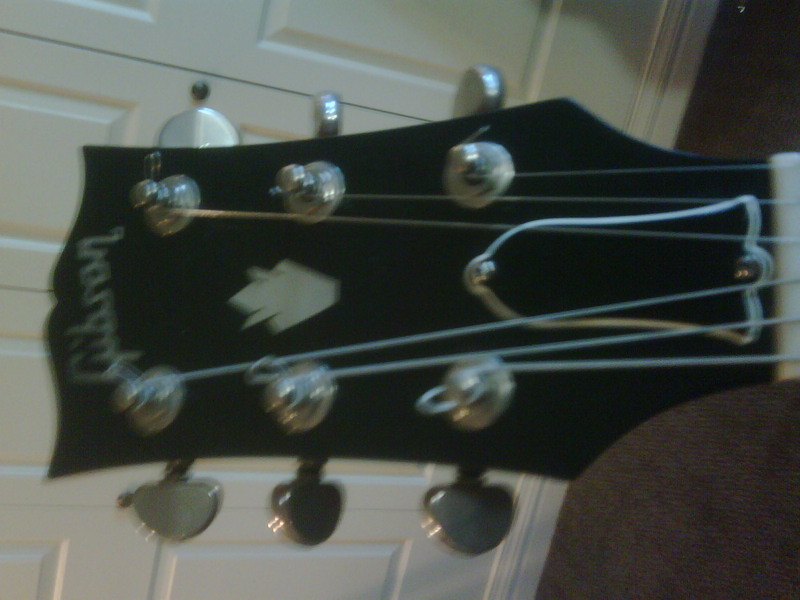 There’s some fret wear, but nothing major where the frets would have to be replaced. As for the fretboard itself, it’s gorgeous. I love ebony fretboards as they’re so smooth to the touch, and it makes bending a breeze. The back of the guitar has a few nicks that don’t penetrate the finish – and no buckle rash. All in all, for as much as this guitar has been played, I’m just amazed at its overall condition. This guitar has all the tone I was expecting out of an ES-335, but as it has been broken in and the wood aged, the tone is A LOT richer than what I remember with my original ‘335. As far as pickup positions go, there are three as usual, though I understand that some models did have coil-tapped humbuckers; not this model, though. 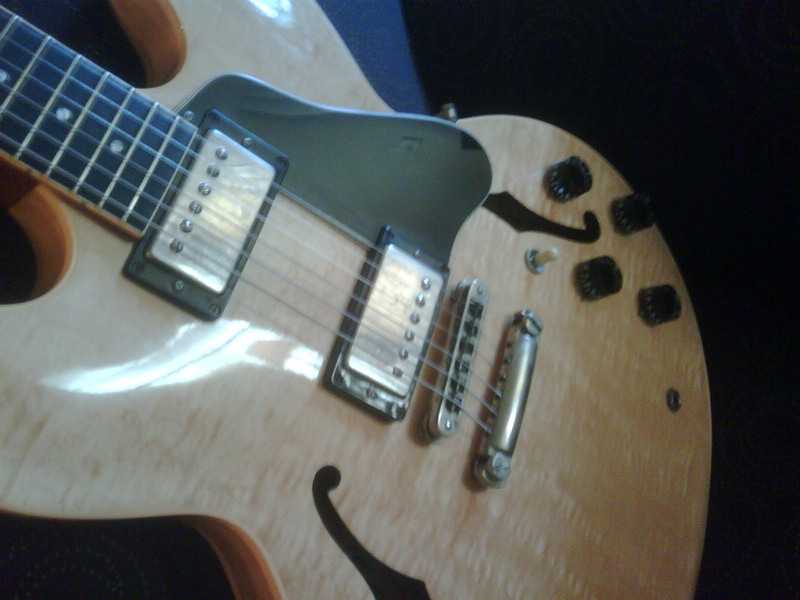 Kicking in the bridge pickup in the middle position gives the ES-335 its distinctive “hollow” tone. It’s really hard to describe, but that I’m a firm believer that that middle pickup selector position is what draws people to this guitar. It certainly is one of the main things tonally that originally drew me to the ES-335 in the first place! With the bridge dimed and adding more or less neck pickup, you can get tons of great tones! The bridge pickup is bright as to be expected – perhaps a bit too bright – but the wonderful tone knob nicely takes the edge off the brightness. I did notice that the bridge pickup is not significantly louder than the neck pickup, which leads me to believe that the original owner lowered the height of that pickup. When I get home from vacation, I’m going to raise it a bit because I prefer to have that dramatic change in volume. 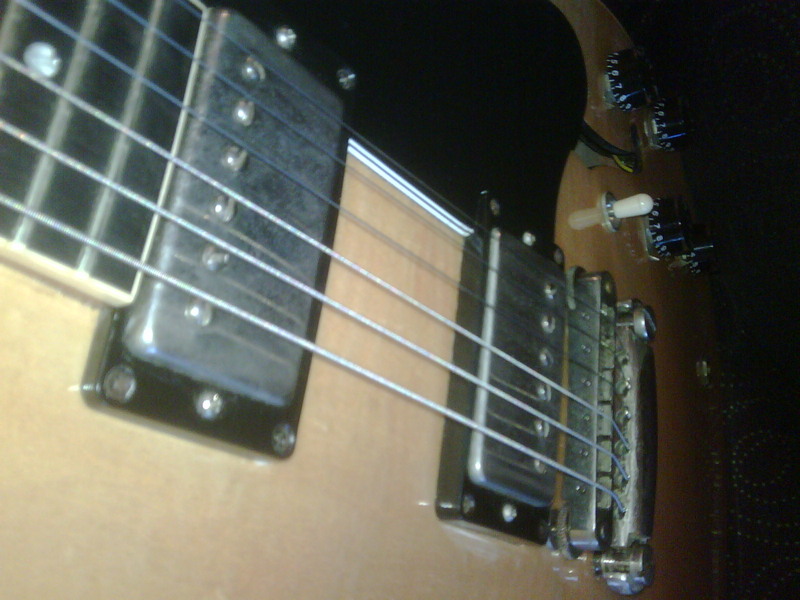 I love the haunting character of the neck pickup on and ES-335. The wonderful thing about this pickup is that it produces a very deep tone, without sounding like an acoustic. Adding a little reverb “grease” only accentuates the haunting effect. Middle position, with some grind for rhythm; bridge pickup for lead. In this, I have the bridge dimed, and the neck about halfway for the rhythm part. The lead is just the wide-open bridge pickup. Notice that it’s bright and almost twangy. I had to do a bit of a tribute to the great Andy Summers with this last clip… 🙂 I added a touch of reverb and chorus to get that “Every Breath You Take” vibe. For all the clips, since I’m on vacation, I don’t have an amp, but I always carry around an IK Multimedia StealthPlug to facilitate my songwriting or, in this case, create clips. I used AmpliTube Fender. For the clean clips, I used a ’65 Twin Reverb model, and for the crunchy clip, I used a ’59 Bassman. There are two parts to this next clip. In the first part, I play in the neck position, then switch over to the bridge in the second part plus attack a lot more. Unlike a Les Paul, the 335 doesn’t sustain as much, but that’s not a bad thing. The net result is that overdrive tones tend to be much more tight and focused. BTW, the amp used here was an Aracom PLX18BB in its drive channel. This guitar really moves me. She plays so sweet and sounds so good that I truly am inspired. Of course, the price I happened to pay for it didn’t hurt at all, but irrespective of my price, I’d still give this guitar 5 Tone Bones. It’s really an incredible guitar! 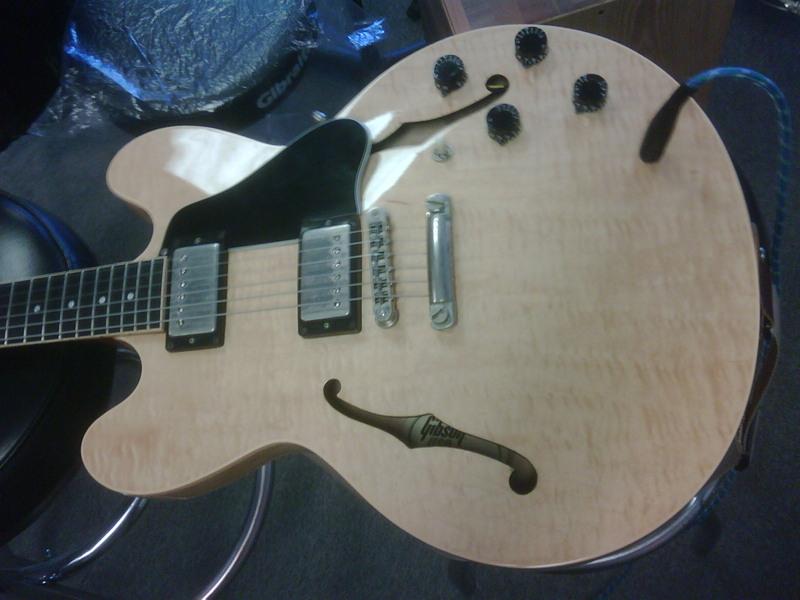 I can’t wait to get it home and to a luthier for a professional setup. The shop owner did a pretty good job of setting the guitar up, but he strung it with 11-53’s which, while certainly playable, aren’t really my cup of tea. I’ll have the shop put on a set of pure nickel 10’s. No matter what, don’t sell this one. She looks and sounds sweet. The IK Multimedia StealthPlug setup works and sounds great. That’s a beautiful guitar, both visually and acoustically. I think the ES-335 feels more like home than any other guitar that I’ve played. Enjoy it! the ES-335 studio does not have F-holes on it, so i guess, this is a standard.